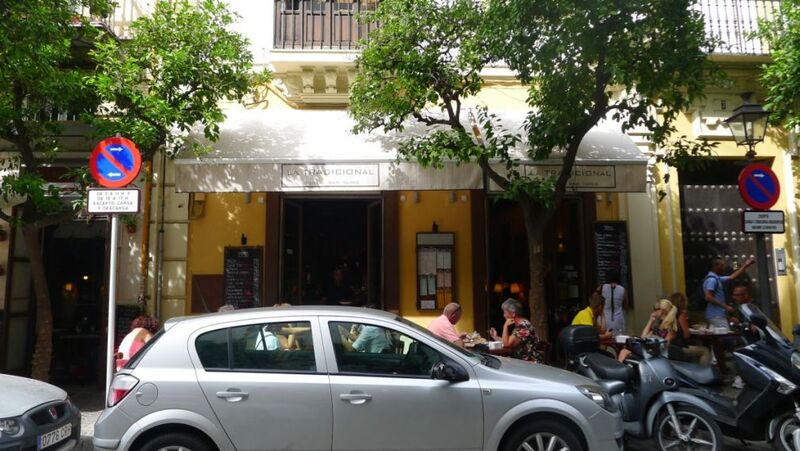 By the time we walked out of the Alcazar it was around 2:00PM so we went back to Calle Mateos Gago where the streets are lined with restaurants and it is really close to the Alcazar. 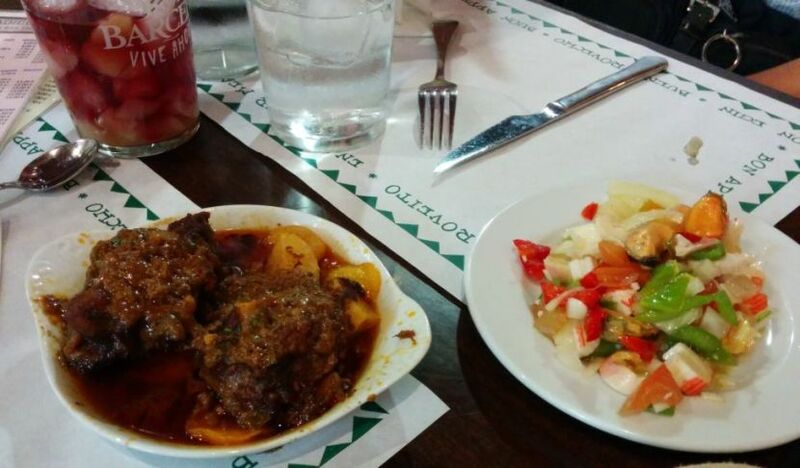 We looked at La tradicional Bodega's menu and it is looks appetizing enough to give it a try. 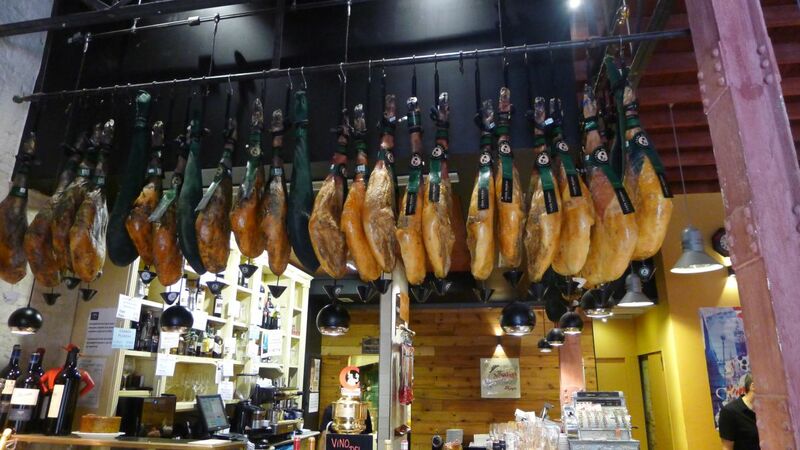 When you walk in the restaurant the 1st thing you see is the bar with a bunch Jamón Ibérico hanging on the ceiling. 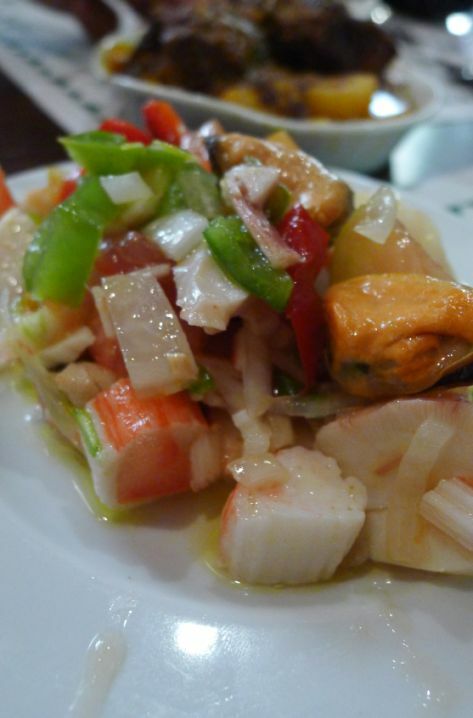 Salpicón is a salad mixture containing chopped assorted vegetables combined with seafood. We were a bit disappointed when we saw that they used imitation crab. 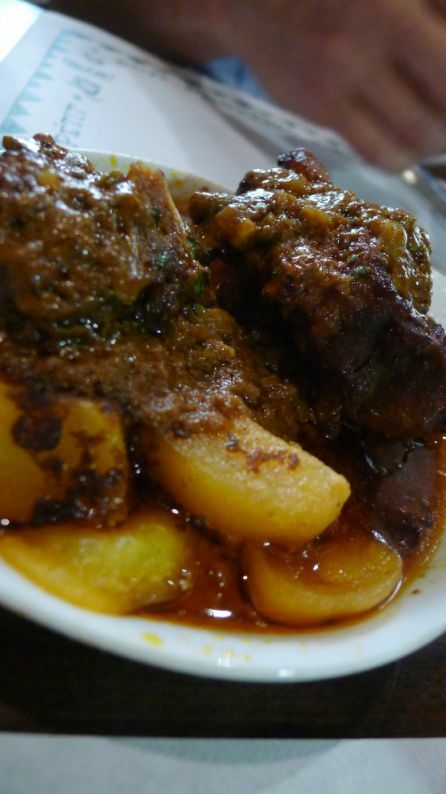 To our surprise the oxtail was notbraised, to me it seemed like they boil it for a short time because the meal is still very chewy which is not a good way to eat Oxtail. 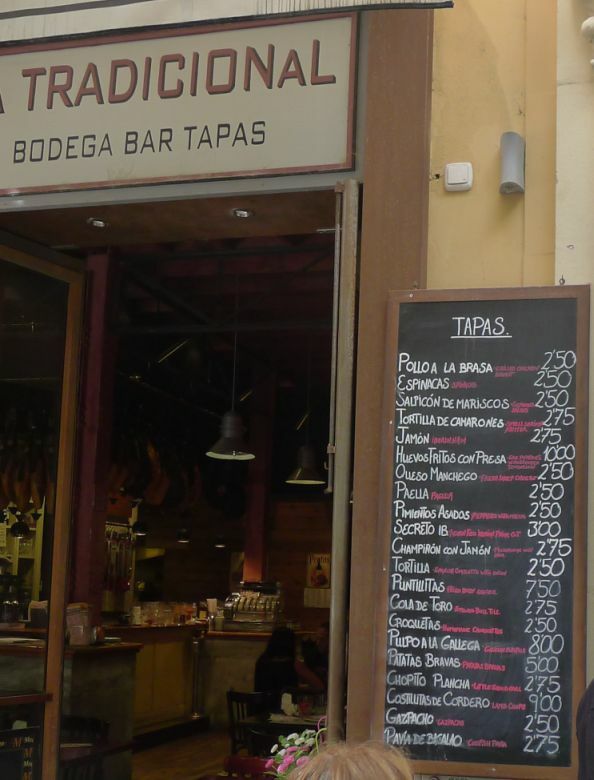 In Spain you can order either tapas size (small portion), Medium, or ración which is a large size. 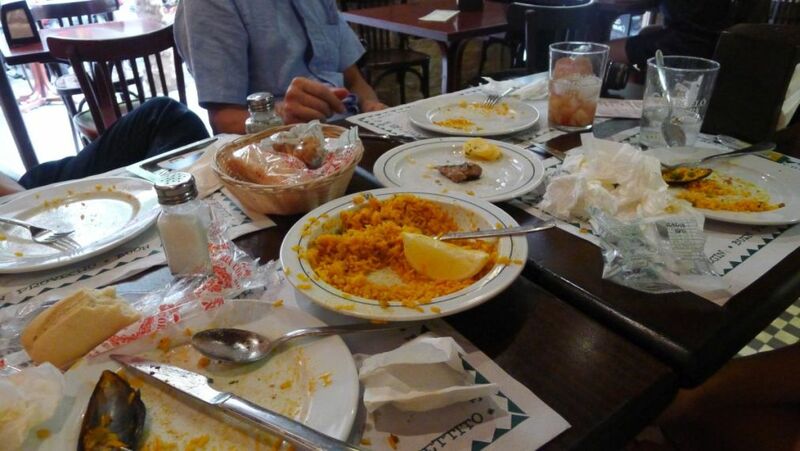 Here we ordered a Medium portion of Paella. The rice was so aldente and crunchy which is a weird way to eat rice. 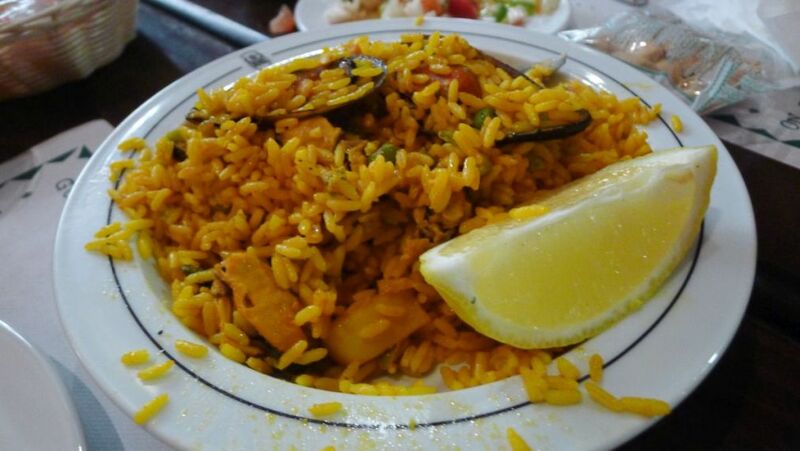 None of us like the paella. Secreto - this is the only dish that was good - the fries were so delicious, they puffed up and had a nice crust. 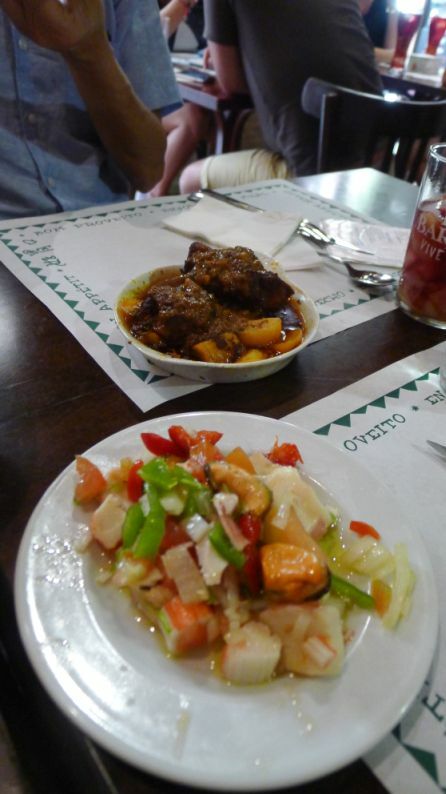 Lunch was not that great, the only dish we liked was the Secreto. 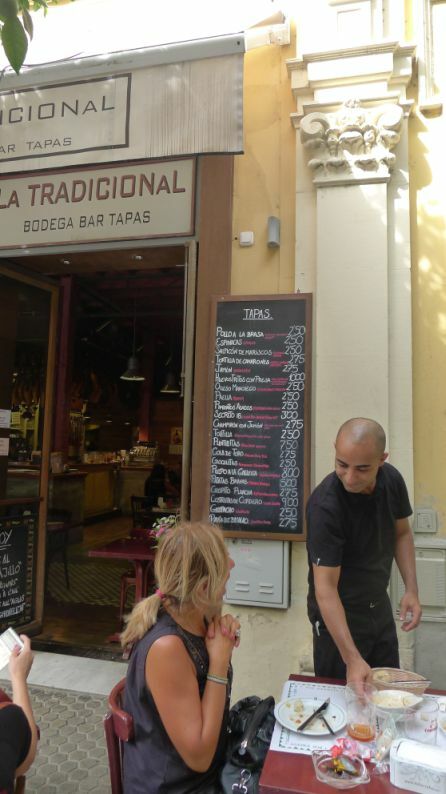 Tapas portion is really small so all we get is a little sample per dish so if it is not good then we just don't re order. 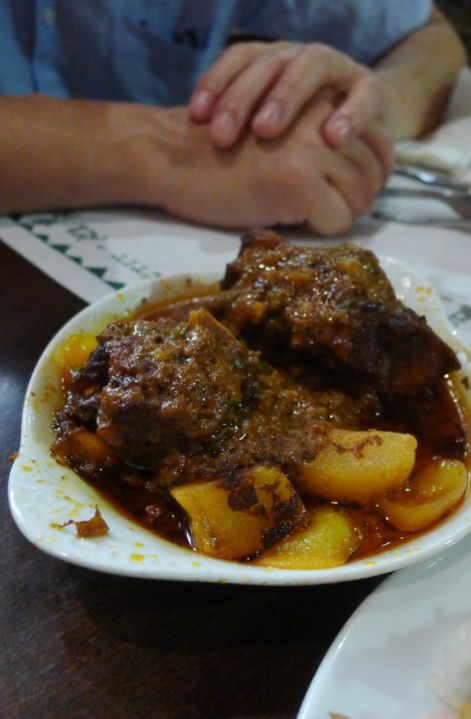 Good way to try a dish without having to pay a fortune. 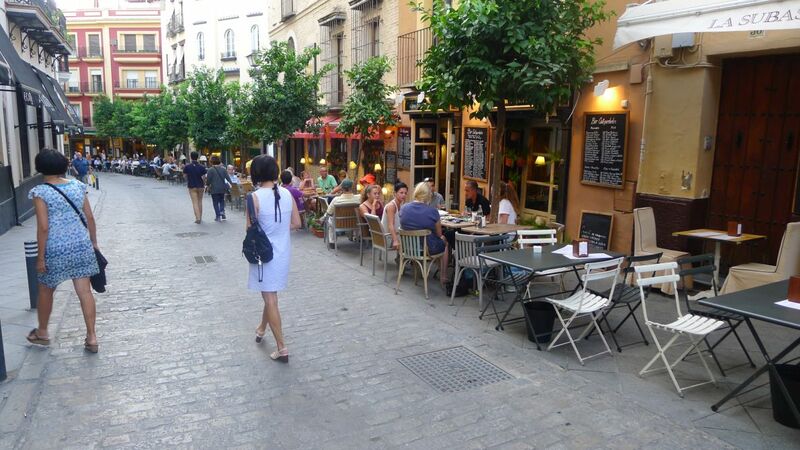 After taking a little siesta we are fully re-energized and ready for dinner. 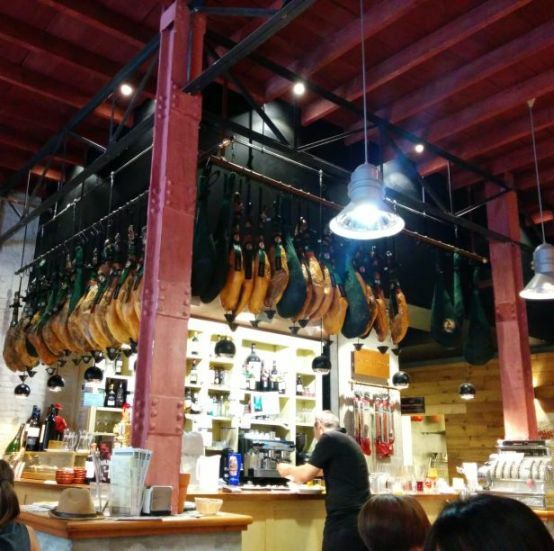 Tonight our 1st stop is Mesón Cinco Jotas, renowned for its pricey Iberian Jamon. 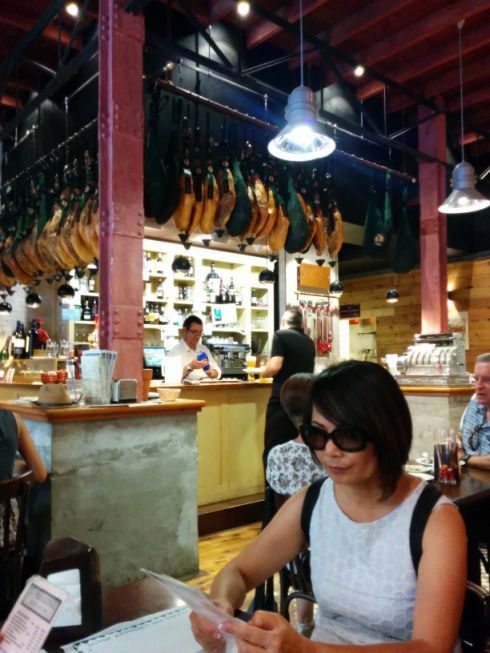 Apparently their Jamón Ibérico is one of the best and Hoa is so enamored with Jamón Ibérico that he cannot wait to eat it again. 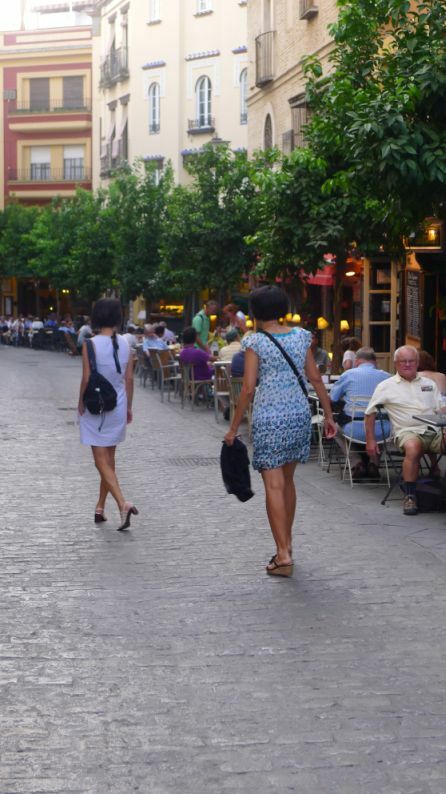 According to our map it is a 15 minutes walk from out hotel. 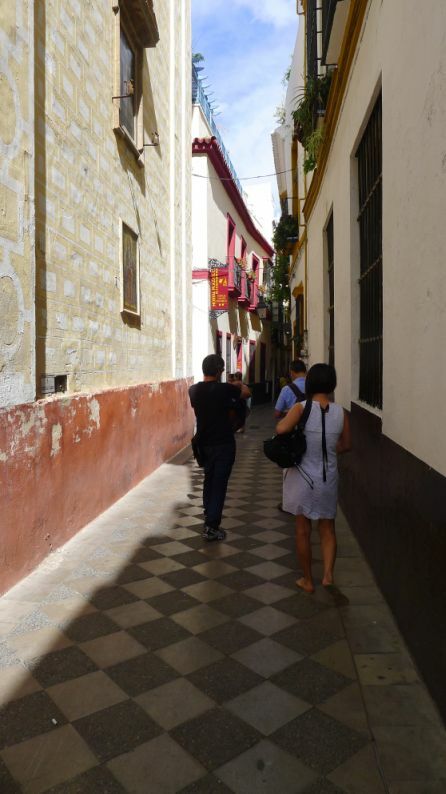 We went through the Barrio Santa Cruz where the streets are narrow and quaint. 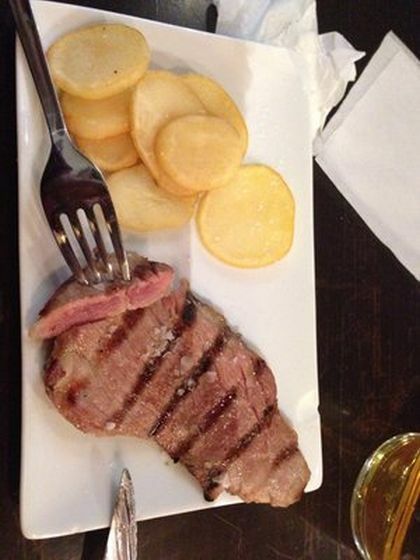 It was impossible to find Mesón Cinco Jotas! 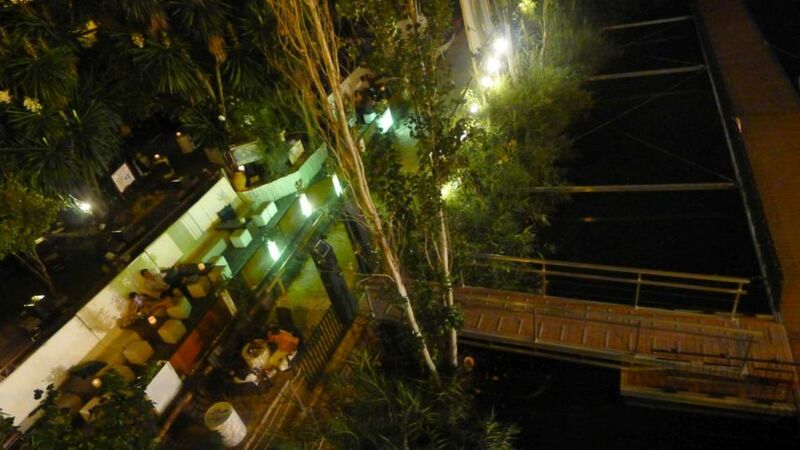 Either I got a wrong address or the restaurant was closed so we asked around and a nice young ex-pat from Germany suggested we cross the bridge and go to Triana located on the west bank of the Guadalquivir River. 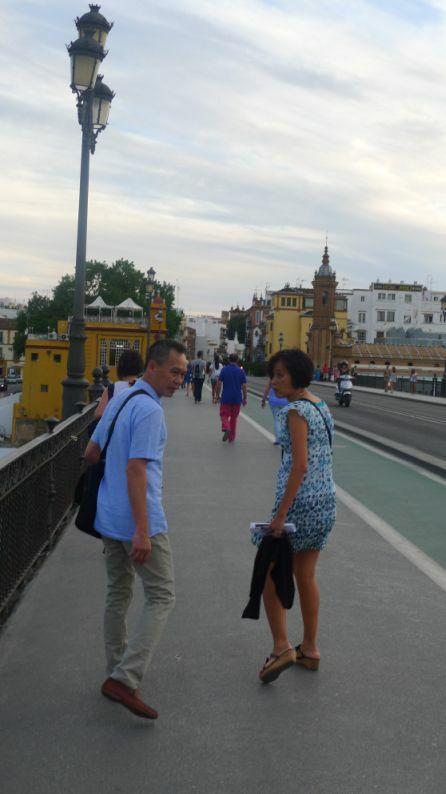 Triana is on the other side of the river. 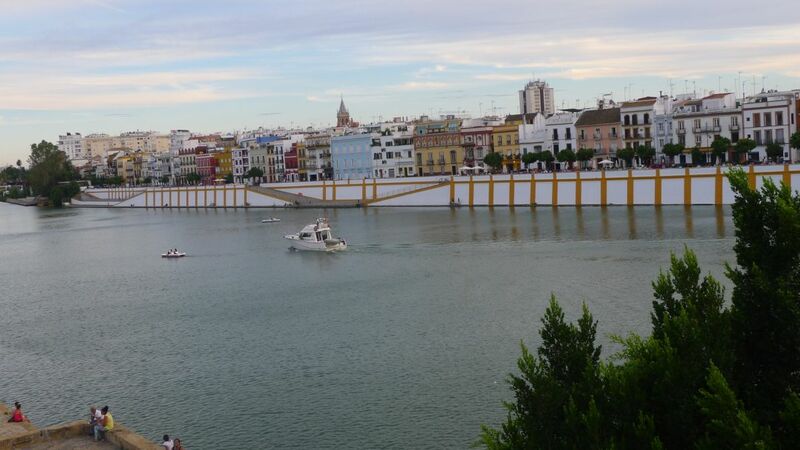 Triana used to be considered the "wrong side of the river" is now the most colorful part of town. 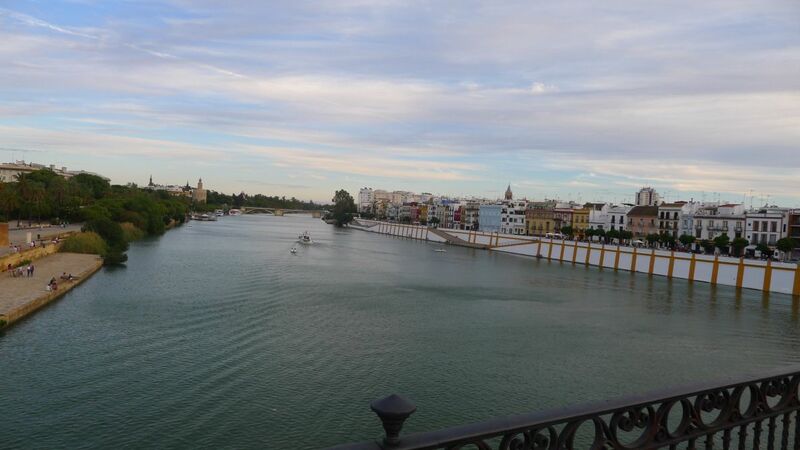 On the left is Seville and on the right is Triana. 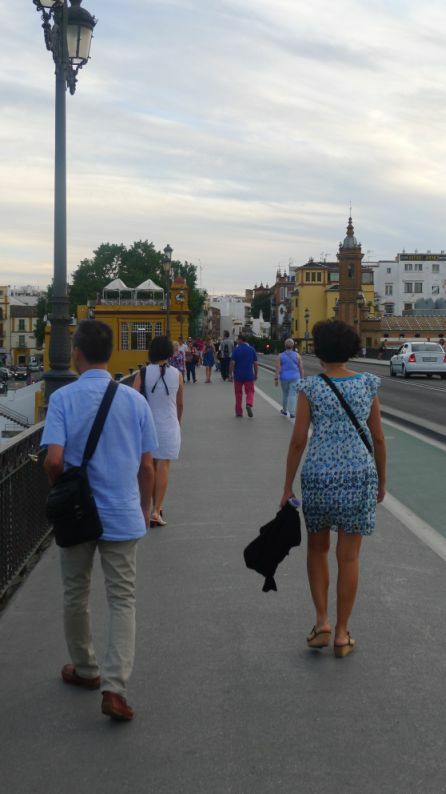 Crossing the bridge to get to Triana. The Cajasol Tower (Torre Cajasol) is an office skyscraper under construction. Construction of the tower started in March 2008 and it is expected to be finished in early 2015. The tower will have a height of 592 ft and will have 40 floors of office usage. 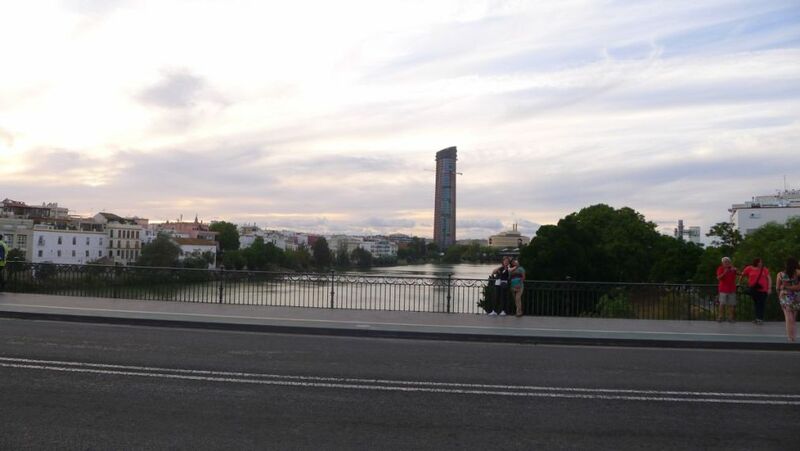 The tower will be the tallest building in Andalusia and the city of Seville. 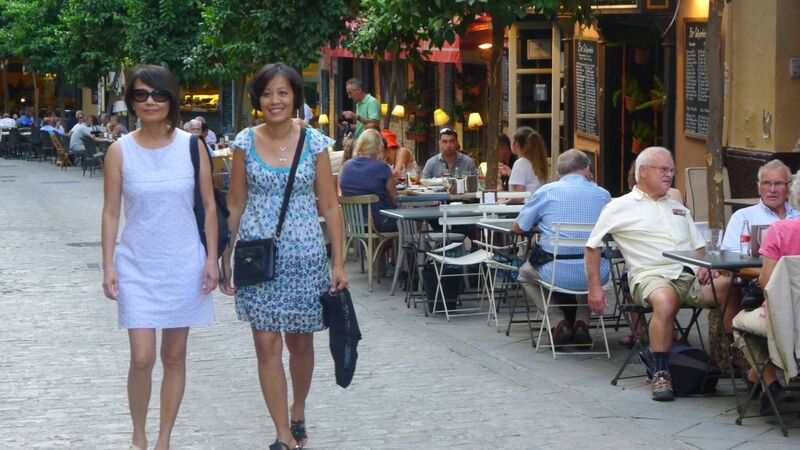 The weather was so nice and this is a very nice walk to work up an appetite. 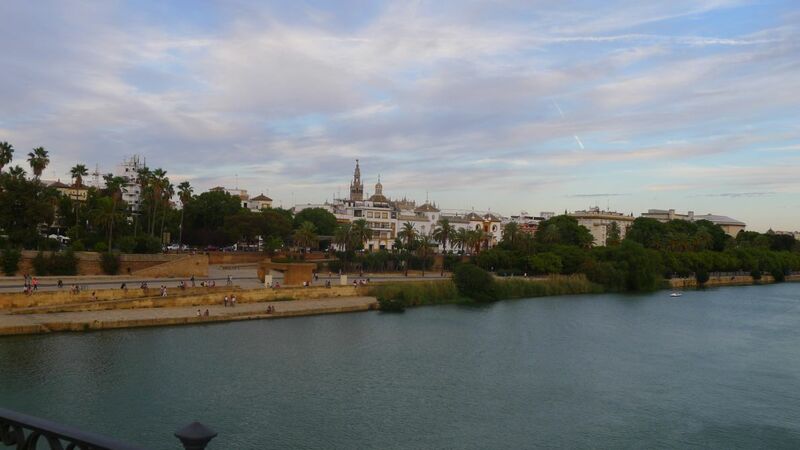 View of Seville as we are crossing the bridge to Triana. 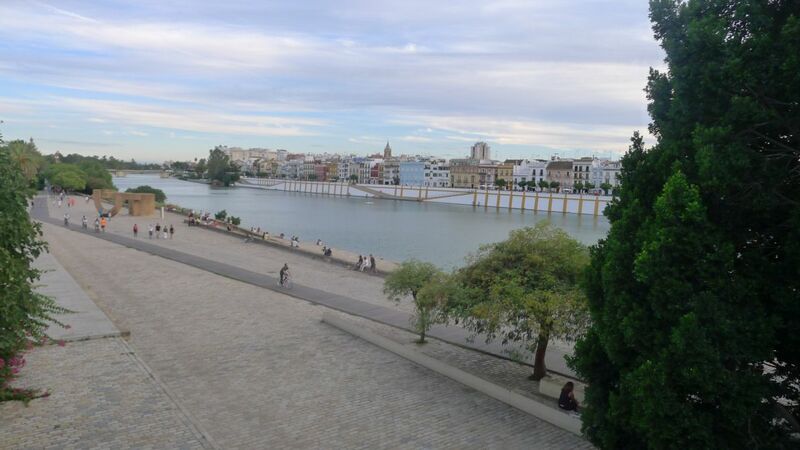 You can see the Giralda tower in the center of the picture. 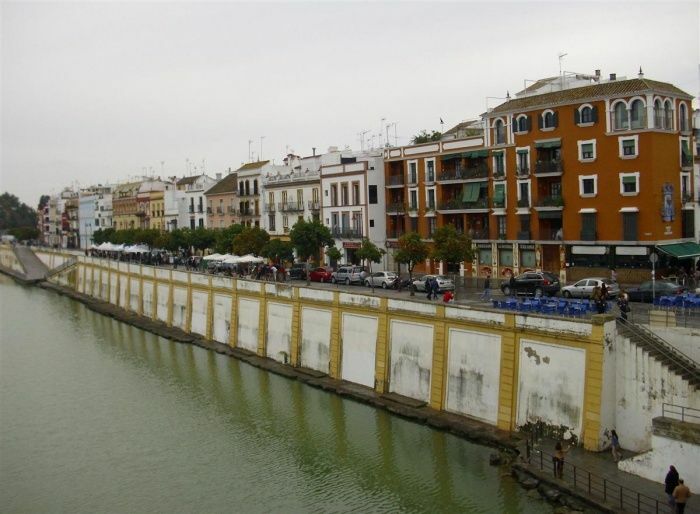 Calle Betis along the water front in Triana. 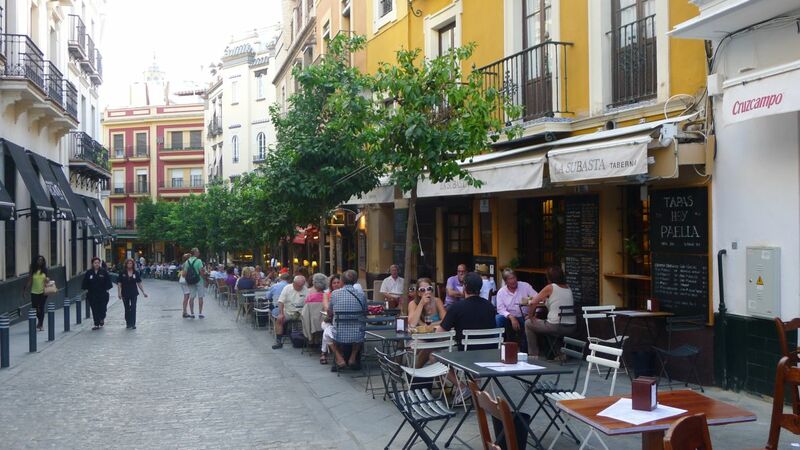 Calle Betis is famous in Seville for it’s lively nightlife. 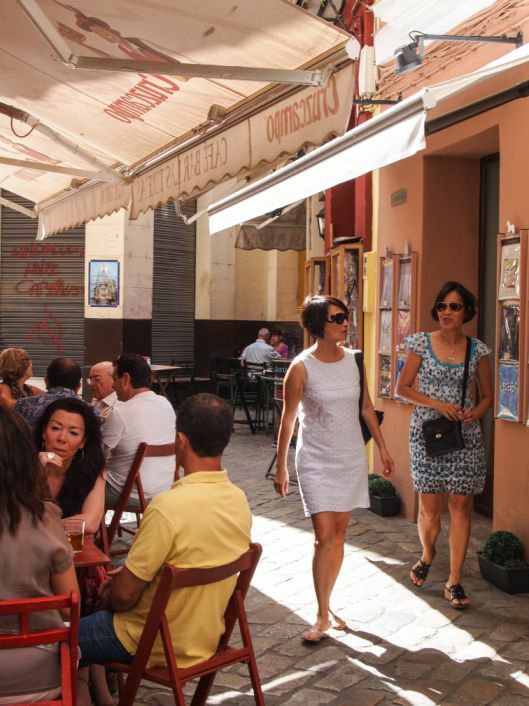 As we are trying to figure out where to eat, waiters will accost you and invite you to eat at their restaurant. 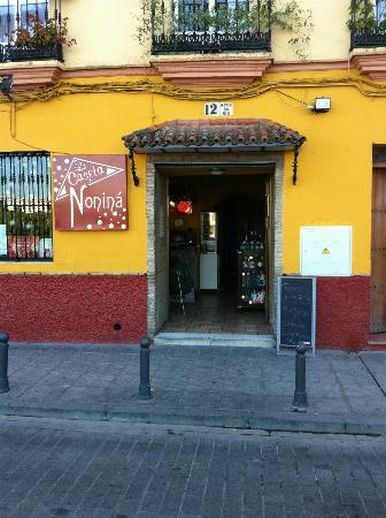 After saying "No" to a few of them we finally say "yes" to Caseta Nonina. 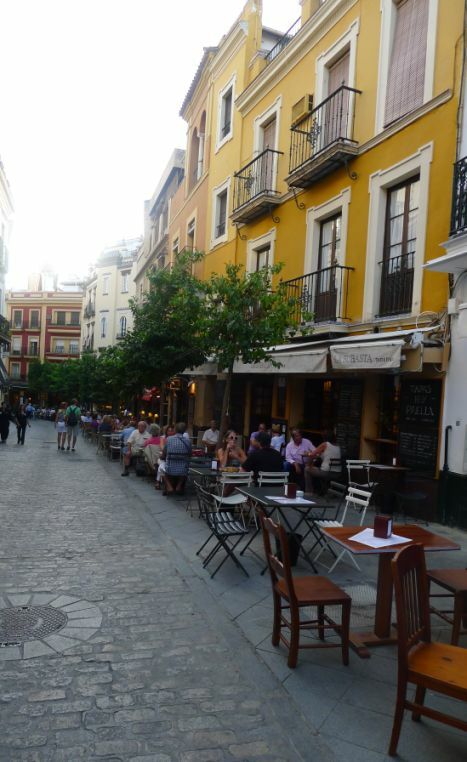 Abades Triana is a new hit in town for special occasions and fancy riverfront dinning. 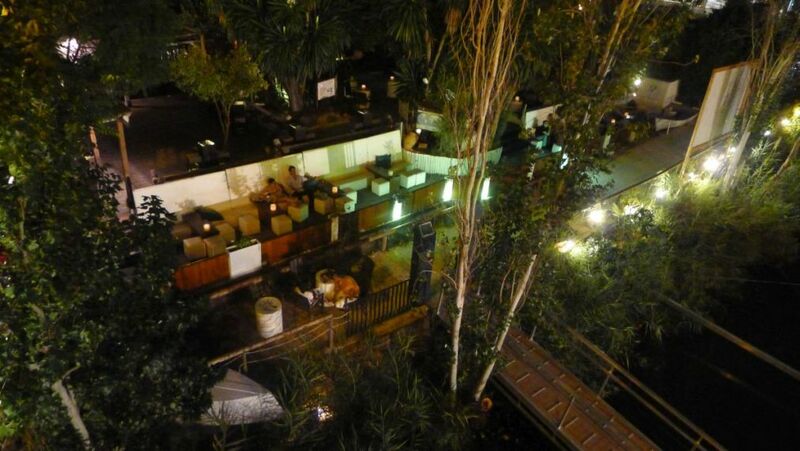 It's a dressy restaurant with formal waiters serving modern Mediterranean cuisine. 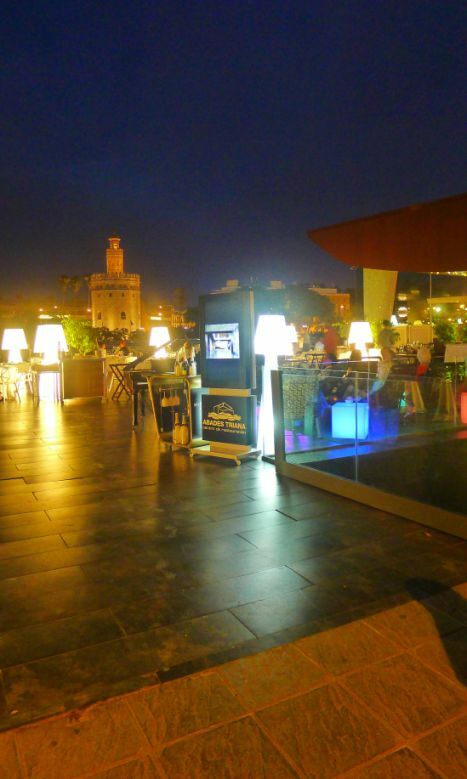 In the center of the picture you can see the historic Torre del Oro (gold tower) named for the golden tiles that once covered it. Today it housed a little naval museum. 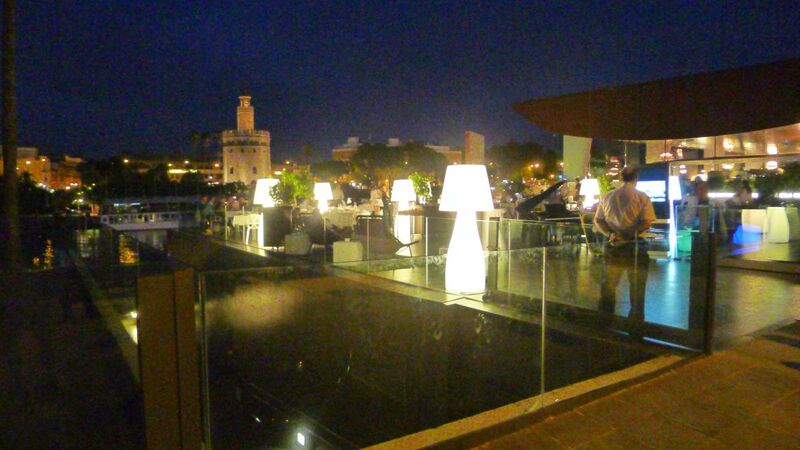 The terrace with a view of Torre del Oro. 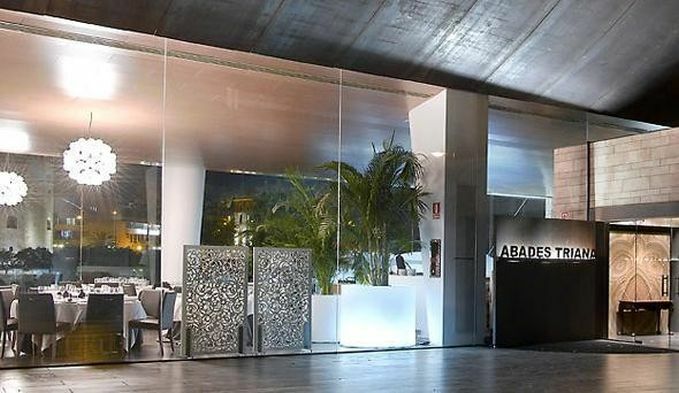 The main entrance. Very classy restaurant. 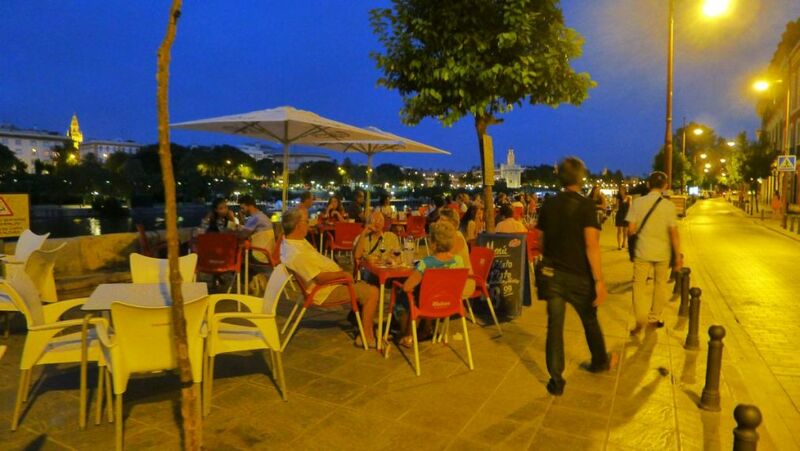 Many large bars are located on the waterfront offering views of the city center where younger groups are gathering. 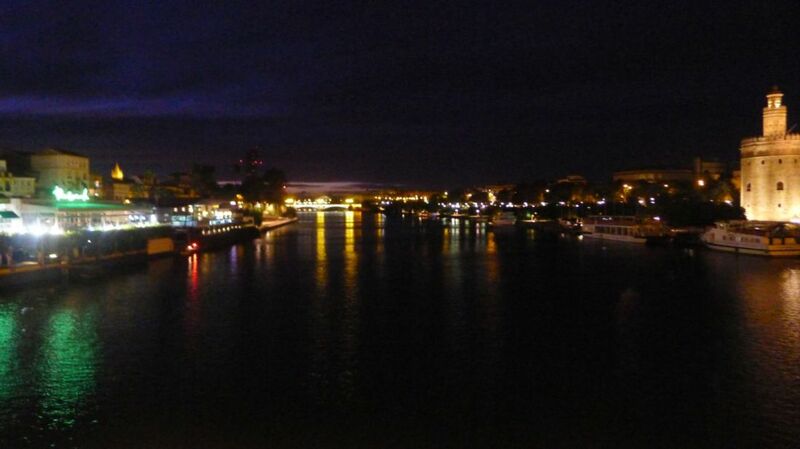 Beautiful view of Triana (left) and Seville (right) at night.